It’s a very strange thing that this book exists at all. 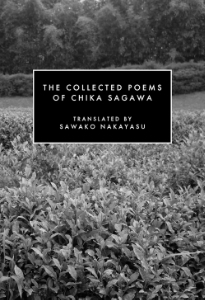 Before the release of this collection (translated by Sawako Nakayasu, from Canarium Books), Chika Sagawa’s work was only available to English-readers in bits and pieces, most notably via a profile in Japanese Women Poets: An Anthology (edited and translated by Hiroaki Sato) and in Nakayasu’s own experimental book of “anti-translations”, Mouth Eats Color. Both of these books were released in the past 8 years. Can you imagine? 70 years between the death of the author and the first English translations of her work. In spite of Japan’s rich history of surrealist and avant-garde poetics, there’s still very little that ever gets translated into English, and, it sometimes seems, very little interest in rectifying that. Scholar John Solt has made the suggestion that this is due to the globalized, westward facing nature of the Japanese avant-garde; that, essentially, such poetry doesn’t feel as purely, authentically “Japanese” as more traditional forms like haikai or tanka. I suspect there’s also an odd cultural imperialism involved: since most surrealist movements (dadaism, futurism, cubism, etc) originated in the west and were then imported to Japan (such an odd thing, importing culture), the Japanese work is considered somewhat inessential, a curious side-story to the main event in Europe. In this history, Chika Sagawa herself holds a strange and often overlooked place. She’s been called (in this book specifically) “Japan’s first female modernist poet.” She was writing in a time when European artistic movements were really gaining traction in Japan, with many works being translated for the first time (some by Sagawa herself). But Sagawa’s modernism looks almost nothing like what we would consider it to be in the west. It’s not a simple emulation of Pound or Eliot; it’s the result of a process of adapting its central concepts to a separate and distinct poetic culture. Japanese modernism is as uniquely Japanese as haikai, and this collection is evidence of that: the more I read it, the more I am struck with the realization that I have never read anything like it. Sagawa’s poems feel more drawn than written. There’s a stillness to them; they progress, but not in a narrative sense. It’s more like staring at a painting and slowly absorbing each individual detail as it catches your attention. The picture is still, but your eyes get wider. Which isn’t to say her work is placid. In fact, her imagery can be almost violently energetic. The images don’t lie back and wait to be seen. They act out, loudly, each one drowning out what came before, until they combine into one wild chorus. It’s almost anarchic; they refuse to behave the way we expect them to. The images are always either reacting to each other, or instigating response. This lends to the wild surrealism that makes Sagawa’s work so vivid. Because each acting image usually gets its own line (and nothing more), there’s a jagged momentum in the jumps between them. These compositional jags are reminiscent of saccades, the rapid eye movements that occur when one reads. Rather than absorbing text linearly, eyes jump about from different points of interest while reading, constructing the whole in bits. This subconscious movement becomes an interpretive act when looking at a Sagawa Chika poem. Her language is so striking that your mind can’t help but disperse. The lack of connection allows the pieces to create their own pulls, as your mind is stretched between them. I often find myself staring at her work for long periods of time, taking in new thoughts piece by piece. Sagawa’s poems tend to be dense reads, but not difficult ones, per se. The act of staring at one for awhile is curiously satisfying. There’s always something to receive. It’s a testament to Sawako Nakayasu’s skillful translation that such dense lines aren’t just understandable, but lucid and elegantly rendered. The information density in that line is typical Sagawa, who, in a Proustian sort of way, always makes sure to completely finish an image before moving on, regardless of how complex it may be. It’s also, in this translation, really awkward. Awkward to the point of obscuring what’s actually being said. Given the basic units, how does one make all that information any more streamlined without losing its surreal tenor? No information is lost here; it just feels more natural, more at home in its new language. Nakayasu, a talented poet in her own right, manages this sort of incredible trick through the whole book. No matter how complex Sagawa’s language gets, the dream logic is never shattered. Back to “Black Air”: There’s another thorough-line in the book, one of personal annihilation. Many poems, especially early on, have a last line that acts as a sort of personal reaction to previous observation, and many of those last lines show the dissolution of the speaker. There’s a temptation to feel like these notions are prescient, what with Sagawa’s early death, at only 25, from stomach cancer. So it’s surprising, then, that the book never feels bleak. The death here is not the desperate, dark fire of Plath or the sad, sweeping desolation of Shelley. Death here isn’t really emotional or dramatic at all; it’s very matter of fact. It is observed, rather than felt. When emotional states are made dramatic, they detach themselves from the author to interact with the world directly. Sagawa remains an observer, even to her own feelings. Or maybe separation is less distinct than that? The image is an emotional actor. The emotional acts are observed like images. Who is Sagawa in this environment? Well, it’s entirely possible that she is the environment. There’s a sense of the whole bizarre world conforming itself to Sagawa’s emotional state. Which is true of many poets and of, y’know, perspective in general, but Sagawa’s great trick is that she still manages to seem peripheral, faded into the background. She convinces you that this is simply how things are. As in, the logical result of a horse going mad is to eat blue food. Or maybe it’s the other way around: in dissolving the self, its contents are allowed to disperse and color the environment. It’s a place that’s difficult to describe without simply quoting her wholesale. So I will. “As always.” Like it’s the most natural thing in the world. And, in Sagawa’s world, it is. Max Cohen is an MFA candidate at the University of Massachusetts Amherst. His work has appeared or is forthcoming in Ghost Proposal, Ninth Letter, and the Columbia Poetry Review. He like haiku just fine but wishes there were more people translating modern Japanese poetry. 1. There are a number of categorical slippages here which seem to occlude your central point. That point, which is that Chika Sagawa’s poems are “strange” (here used interchangeably with “surreal” or “surrealist”), is not wrong, but it obscures as much as it expresses. What is “strange” about them? Is it that they are “nothing like Pound or Eliot”? Is it that they are “modern” but at the same time “not Western”? As your reader I find myself a little at a loss to get a sense of what, exactly, compels you about Chika Sagawa. 2. I’m not sure what you mean, incidentally, when you say that Chika Sagawa’s poems are nothing like Pound or Eliot. Does she not expressly invoke and allude to Eliot? Does not the translator point out Sagawa’s own strong convictions regarding the greatness of (western) avant-garde art by Dadaist and Surrealist writers? In my reading we end up with a complicated statement of the global or total character of modernity. There is no “alternative”, there are no “alternatives”; one’s position with respect to the global empire (which is, we agree, seated in the West) certainly varies, but we have one modernity. I say all this because you seem to suggest that Sagawa has miraculously invented a whole other modernism that refuses to be “subsumed” in the Western strains, that is empirically distinct. Would it not make more sense to talk about how she takes on the challenges of that aesthetic ideology, and sets out to negate it? Is she not engaging in a complicated interaction with the west? do not her poems complicatedly mediate this? 3. I mention this rather theoretical point about modernity because it seems to me that the fear that underlies this piece is somehow being “racist” by suggesting that a poet who is not “western” is “modernist,” let alone–heaven forfend!–interested in the avant-garde. I belabor the theory an instant more: Peter Bürger helpfully delineates for us the “historical avant-garde,” which is, yes, a periodization located in the west, but which makes clear that when we talk about the avant-garde we are not making metaphysical claims or even aesthetic ones about the “kind” of writing being done. It’s a historical problem. That history, in its own way, involves an aesthetic ideology (for Bürger the attempt to destroy the distinction between art and life, in his reading of Surrealism in particular), but it is above all historical. 4. Following from this we have to be honest about our terms and categories: “surrealism” is not an aesthetic. It is not a style. It is not a mode. It is not a general feeling-tone. It is a historical designation of an affinity among artists, just as is Dada (which, incidentally, is not “Surreal,” in fact, the Dadaists CLASHED with the Surrealists in the 1920s) and just as is, say, the New York School. “Cubism” is a jot more complicated, certainly, and I’m not sure why you mention it. Nevertheless, Surrealism refers to the avant-garde. There is no way to talk about poetry in terms of its “surrealism” or relation to surrealism without invariably talking about the avant-garde. The historical avant-garde includes, BY NECESSITY (we cannot choose to exclude it) surrealism. If we attempt to say that someone is avant-garde, but not like those other avant-gardes, we displace the whole problem of modernity (can we just say “capitalism” here?) and involve ourselves in the kind of cultural anthropology which was, as we all know, the very method and ideology behind what someone like Ezra Pound did in his ruthless appropriations of Chinese and Japanese culture. 5. In a slightly different, though ultimately continuous, vein, I don’t know what the distinction between “density” and “difficulty” is here. It seems as if you are unwilling to make a claim about the ways in which Sagawa actively interacts with the modernist writers of the West–and, again, the translator’s introduction is helpful in pointing out that this work actively responds to, draws on, and incorporates the influences of Eliot and Pound, of Dadaism and Surrealism. I wonder if this does not flow from a fear of being “racist” that ends up so isolating and idealizing Chika Sagawa that it sounds, at points, like you wholeheartedly endorse and indeed extend the ideology that Pound so successfully articulated, which is currently an institutional dominant. 6. Relatedly, your claim seems to be that we can’t read these poems (or their translations) closely, that the “speak for themselves.” It seems to dovetail nicely with Archibald MacLeish’s famous claim in his poem, that poems should not mean, but be. This, it hardly warrants mentioning, is ALSO a statement of the ideology of modernism, and it is moreover a rather unsettling version of it because in this context it seems as if we are asking (along with Eliot, Lewis, Pound, Ford, and their various “anthropologist” inspirations) that some “foreign” culture “speak its own truth” to us, as though we cannot think it, inquire into it, understand it as anything other than, well, absolutely Other. I hesitate to continue this particular thought as it has been rather fully elaborated elsewhere, in Edward Said’s book Orientalism, where he describes this gesture as a foundational one of imperial western racism. 7. This review attempts a miraculous ideological feat, to do justice to what we both agree is a great book, while not playing the familiar tune which situates it as part of an ancillary strain of cultural production. You refuse to make Chika Sagawa a footnote. This is great. But in so doing you have so rarefied her in your description that she is no longer a poet who is part of the legacy of modernism, a legacy that, as anyone will tell you, is still with us, whether we like it or not. My concern, then, is that reading Chika Sagawa, in translation no less, requires us to contend with how we are VERY DIRECTLY IMPLICATED in the history of western imperialism, and that no amount of hemming and hawing, of distancing and qualifying, can change that we very often repeat the most insidious components of an ideology of modernism when we are at our greatest pains to disavow it. I think this is clear in the way you describe various parts of her poetry. A quick comparison finds very similar sentiments in your review of Sagawa and in Ezra Pound’s “A Few Don’ts.” I don’t mean to say that either you or Pound is “more right” about it, but that the sentiments, the language, the underlying aesthetic ideology: you share these things. 8. I end only with questions: how can we write about modernism without simultaneously refusing to acknowledge that whatever writing we do IS modern, participates in that ideological production and struggle over the term “modernity” and over the concept itself? How can we properly account for our own, necessarily violent, relationship to a text–we read, after all, in translation: is this not “violent” in some fundamental way?–without having to displace it onto a set of shibboleths that aren’t even really shibboleths anymore, just names for what we don’t want to say: THE ACADEMY. WHY is it that we only feel comfortable discussing non-canonical modernist work once we have made it clear that the lack of canonicity is at once a terrible cultural failure and a necessary component of our reading? Why is it that the reading of Sagawa is more rarefied than Ezra Pound? Why is it that it doesn’t occur to us that this rarefying is not itself every bit as racist as the way Ezra Pound treated Chinese poetry, if not more unpleasant for the ways in which it hides its own violences beneath a sheen of heroic anti-establishment behavior which is, really, not all that anti-establishment in the first place (Canarium is a part of the process, a part I very much love but still a part of the process)? 9. Why is it that the idea of being “outside” of institutional accounts of the history of literature so appeals to us, to the point of our willingness to wrench out of that historiography the writers who very directly and enthusiastically wanted to participate in it? Who benefits from this? Sagawa or you and me?